Expedition 13 Flight Engineer Jeff Williams (left) observes STS-121 Mission Specialists Lisa Nowak (center) and Stephanie Wilson as they use the robotics work station to move the multi-purpose logistics module with the station's Canadarm2. HOUSTON - The astronauts aboard the spaceshuttle Discovery will take a second look at the orbiter's heat shield today,but are quite content with how pristine the spacecraft appears to date. STS-121 pilotMarkKelly and mission specialist StephanieWilson are set to guide Discovery's sensor-laden inspection boom to severalareas that have piqued interest from flight controllers. The shuttle crew is scheduledto spend about four hours today on focused inspections of Discovery'sheat-resistant tiles and wing leading edge panels. "At thispoint we're really satisfied," Kelly told CBS News Radio during a series ofinterviews from space. "We haven't really had many problems with Discovery." Earlyreports from image analysts on Earth have turned up fewconcerns over the shuttle's well-being or any doubts of its ability to returnhome safely. Image analysis is still ongoing, but mission managers saidThursday they anticipated clearing the orbiter's heat shield by the end ofthe weekend. "I'm notall surprised," shuttle commander StevenLindsey told Fox News Radio. "We're obviously really pleased that thingsare going well and hats off to the shuttle team." Lindsey andhis seven astronaut crew are in the fourth day of a 12-daymission - a potential one-day extension is expected today - to theInternational Space Station (ISS). They dockedat the orbital laboratory Thursday after a July 4thlaunch, and are the first human visitors in three months for the station's twoExpedition13 astronauts. "Yes, it isa full house," said NASA astronaut JeffreyWilliams, a flight engineer for the Expedition 13 mission, to flightcontrollers later Thursday. "The climate here has changed significantly." Discovery'sSTS-121 mission is NASA's second orbiter test flight since the 2003 Columbia accident andhas already fulfilled a major flight goal - returning the ISS to itsthree-person crew capacity - when it ferried European Space Agency (ESA)astronaut ThomasReiter to the orbital laboratory on Thursday. The STS-121crew also delivered a pressurized cargo pod, the Italian-builtLeonardo module, to the ISS earlier today, and plans to conduct themission's first spacewalk on Saturday. "Today,we're gathering up our tools and equipment," STS-121 spacewalker and missionspecialist MichaelFossum said. "We'll be setting up the space suits and doing some checkouts." Fossum andfellow STS-121 spacewalker PiersSellers will safeguard a cable cutter on the station's railcar-like MobileTransporter, to prevent the accidental severing of a critical data and videocable during Saturday's planned extravehicular activity. They will then standat the end of Discovery's 50-foot (15-meter) orbital boom - which itself willsit at the end of the orbiter's already 50-foot (15-meter) robotic arm - totest whether the outstretched 100-foot (33-meter) appendage can function as astable work platform for heat shield repairs to Discovery's undercarriage. That firstspacewalk is set to begin at 9:13 a.m. EDT(1313 GMT) on Saturday. Likeseveral of his crewmates, Fossum is making his first spaceflight duringDiscovery's STS-121 mission. The feeling during launch, as Discovery firstthrottled down then ramped back up to reach orbit, was something else, he said. "It wasjust better than I ever expected," Fossum told ABC News Radio. "You really feltzooming, if you will, and the pressure kept building until you reach three Gsand then nothing. You're in space." Lindseytold reporters that he expected to be unnerved Thursday when he guidedDiscovery through anorbital back flip to expose its tile-lined belly to the ISS crew, and hewasn't disappointed. "Thevehicle reacted exactly as I expected," Lindsey said. "I would tell you though,I don't like being upside down and out sight of the space station at 600 feetbelow it." 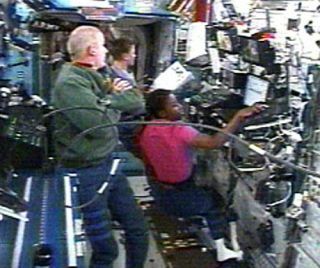 But he andhis crewmates - especially Kelly and Sellers, who have flown to the ISS before- were impressed by how neat and tidy the Expedition 13 crew had prepared thestation for their visit. "There isnothing quite to describe what it's like...to go dock with another vehicle inspace, and then to open the hatches and then go from your vehicle into a newvehicle," Lindsey said. "It's really a neat feeling."